The World of Nothing is the setting of Chapter 6-1 in Super Paper Mario after The Void destroys Sammer's Kingdom. The world is almost completely blank—an off-white screen with thin black lines at the borders of the ground. The few remnants of Sammer's Kingdom are scattered sparsely across the world. After the game is beaten, Sammer's Kingdom is restored to normal and the World of Nothing becomes inaccessible. After the Void expands to the point of consuming Sammer's Kingdom in Chapter 6-2, Tippi warps the heroes back to Flipside. However, they notice that the Dimensional Door leading to the world is still there. Since they still need the world's Pure Heart, the heroes enter the door and are shocked to see that all that remains is a blank world. After traveling through the world for a while, the heroes find the Pure Heart, which has been drained of most of its power and turned to stone. Mr. L then appears, takes the Pure Heart, and fights the heroes inside his upgraded Brobot, Brobot L-type. After Mr. L is defeated again, Mario and the others return to Flipside with the petrified Pure Heart to consult Merlon about what to do with it. Shortly after they leave, Mr. L regains consciousness and is visited by Dimentio. Dimentio knocks Mr. L out, sending him to The Underwhere and reverting his consciousness to Luigi. The destruction of an entire world was a great and terrible tragedy. But Mario and his allies had survived the cataclysm and found another Pure Heart. The end of that world had dulled the shine of the Pure Heart they had found. Was the Pure Heart's power lost forever? Later in Chapter 8-3, Mario and Luigi return here while chasing Dimentio through the seven worlds. The heroes must use Fleep on a sparkling rift to unveil a blue block that warps them to the next location in the chase, Underwhere Road. 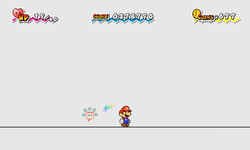 The World of Nothing is the only chapter in Super Paper Mario that does not have a Star Block. This page was last edited on March 25, 2019, at 02:21.